Thanks ever so much and a Card Giveaway! I do enjoy this time of year with all of the holidays and preparations and family time. 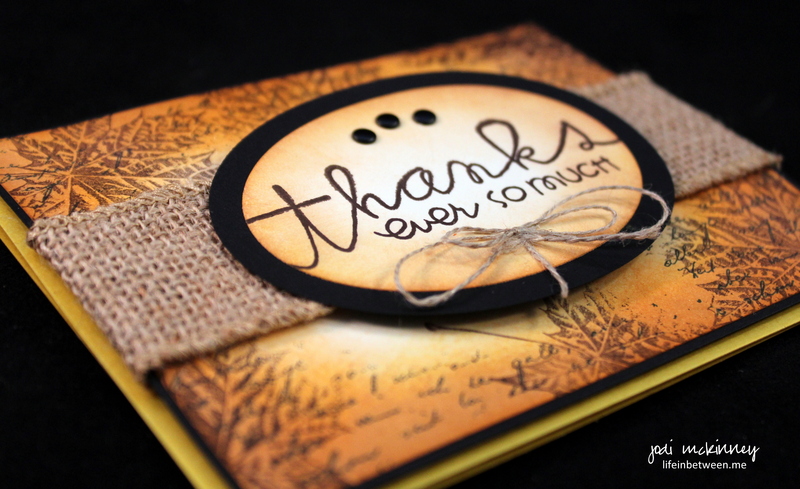 November reminds me to be thankful, and our theme for this week’s Paper Players Challenge seems so fitting: Let Us Give Thanks – Fall Thank You Cards (PP269). I would like to send this card to one of you to use to send to someone you want to thank. 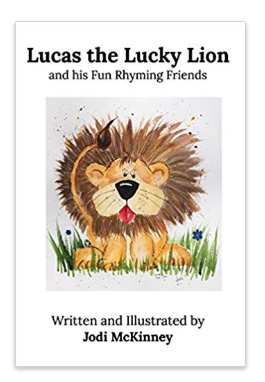 Simply leave a comment – a simple hello or anything that is on your mind, and I will do a random drawing on Friday to choose someone to send this too. I may even add another bonus card or two! I masked off an oval in the center of a piece of very vanilla card stock and stamped it with the Penny Black Script Letter Background stamp in Memento Black ink. I then randomly stamped on top of the edges with the Inkadinkado Maple Leaf stamp. This was followed by sponging the edges in three layers of color beginning with StampinUp Crushed Curry, Pumpkin Pie, and finally Cajun Craze inks. I cut out two ovals with StampinUp Oval Framelits using #2 and #3 from the smallest – #2 in very vanilla and #3 in black. Same sponging was done on the small oval as the larger piece, and then I stamped the Thanks ever so much Sentiment on using the Paper Smooches Pretty Phrases stamp set. To put it all together, I matted with another piece of black onto a Crushed Curry Base. Embellishments to finish it off included some dark brown candy dots, a bow of linen thread, and a ribbon of burlap. Be sure to check out the other design inspiration cards by our amazing design team at The Paper Players and play along with us. Thanks again friends, and be sure to leave a comment for the drawing! I can’t wait to share this with someone. 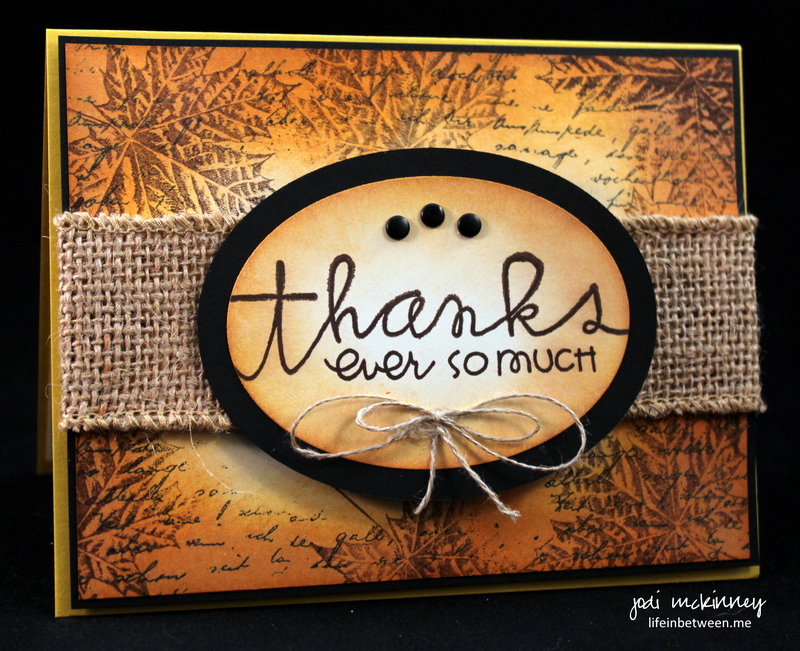 Thank you Jodi for sharing how you made your card…it is beautiful! Blessings and I think I heard somewhere around midnight “they’re off!” for the Holiday rushes! Must have been dreaming!!! 7 weeks till Christmas? WOW! That card is beautiful. I love sending gratitude cards in November. Thanksgiving is one of my favorite holidays. I may try to case this card!!! Of course I would comment for the chance of snagging that gorgeous card…but mostly for the opportunity to admire your handiwork! Thanks for inspiration, Jodi! Your cards are always works of art Jodi! I’ve asked you before, do you sell them? You certainly should! I’m sure everyone who receives one is thrilled~ Happy Novemeber! And yes, the holidays are upon us! Thanks Jenna – I have a few on my LifeinBetween Etsy site, but I really don’t focus on it. I usually spend quite a bit of time on each and it is for a specific purpose, so I could never make enough money to pay for what I put into it – haha! Plus it kind of takes the fun out of it for me. But you never know – Sometimes I change like the wind 🙂 I appreciate your kind comment! What a nice idea, Jodi! And of course another lovely card…..agree with the above commenter who states you really should be selling these! Thanks Torrie! For now, I really much rather enjoy giving them away and making them each unique and individual. I do have a little Etsy shop that I started but have not really promoted or done much with. Maybe at some point. Thanks for your sweet words! Enjoy seeing your work, my question is, when do you sleep. You are talented in so many ways, I’m truly envious. Thankful…good reminder; Christmas is 7ish weeks away…bad reminder. But let’s keep an attitude of gratitude this month, shall we? At life in between has become my treat in the morning. Yes you trump coffee! By starting my day of with your always beautiful, heartfelt and thought provoking blog, (to 15 year old me was excellent), I feel that it recenters me to start off on a properly motivated path and from pure spot. You set the tone for my day and I couldn’t be more Thankful! Charlie, you artwork and the recipes inspire me. God bless and I hope that you always have fresh inspiration to fuel your beautiful heart. And please keep sharing. You are doing something so amazing. Hugs love and prayers. Oh Jodi, this card is so rich and gorgeous! The layered sponging of colors is amazing and adds such depth to the images. Must. Try. That. The card simply glows…beautiful! This is a beautiful Thanksgiving card Jodi but we all have so much to be thankful for – not just at Thanksgiving. I love reading your blog in the mornings and I love everything you blog about. Put my name in your jar 4 or 5 times. LOL! LOL! You are always such a kind supporter! Thanks PJ!! You inspire me, Claire! Thank you for your sweet words! Your card making us so awesome Jodi. They are always so inviting to open. I viewed the other cards as well, all beautiful and so different. On to November, what wonderful surprises are ahead? Thank you so much, Catherine! So much to be thankful for! Gah! I can’t believe your husband reminded us that it’s just a bit over 7 weeks to Christmas. I wasn’t panicking before, but I am now. 😛 LOL! Such a gorgeous card with great fall colors. I think the burlap detail really makes it extra special! Hello Jodi: I just love the texture of the burlap ribbon and twine, and the rich colors of your gorgeous card, the shading you did, from light to dark gives out a lovely glow. I believe we should be grateful all year round, family and sweet friends add sugar and spice to our Lives. Thank you for the chance to win this lovely card. Thank you Maria – I appreciate your comments! Gorgeous card ~ once again. You’re truly gifted, Jodi. You are such a sweetie Ann! Thank you! I love the warm colors in this card as well as the message! I am so drawn to your card! I love how subtle yet beautiful the background is. Fall is one of my favorite times of the year and I just love trees and leaves. Love the background and everything else about your card. I need to get some burlap because I see how it can add some lovely texture and dimension to a card. Thank you for the opportunity to win! Thank you for your kind words Roberta! Sometimes the littlest different things can make such a difference. Awh! You are the sweetest ever Jill! Thank YOU! This is a beautiful card!!! Thank you for sharing! I love it too. Thanks for sharing. I could never make the cards you do, but I enjoy looking at them! You might be surprised! 🙂 Thank you! Beautiful fall card, Jodi! Your shading is just perfect! This is one of the prettiest Fall card that I’ve seen. When first laying eyes on it, I sucked in and held my breath for a moment….it is that well done. Awh! Wow! Thank you for making my day! You are as kind as you are funny, Paul! Thank you! Lovely card, Jodi! A friend recently directed me to your blog and I was hooked immediately I even forward it to my husband, who’s an amateur watercolorist. He enjoys it as much as I have. Hi Connie! So nice to hear from you, and thank you for sharing your kind words! I am so appreciative! You had me at “card giveaway”! I always admire your cards. You did one some months ago…may have been a sympathy series, very simple with purple flowers that I still think about when I see a new card pop up. Such pretty little cards you make! I really enjoy your blog! 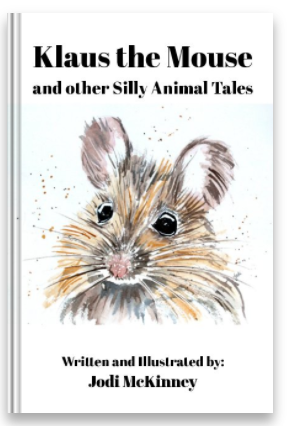 I’m not sure what my “department” is, as I like them all and I think the variety (your art, Charlie’s guest blogs, the great recipes) are part of what makes it so interesting. Keep up the great work! Ah, this card just glows with fallish goodness! You have that knack of making a plain piece of paper turn warm and fuzzy just with some stamps and ink! Beautiful! What a sweet comment! 🙂 Thanks LeAnne! Jodi this card remains me of piles of autumn leaves and cozy log fires – the colours and details of your background are amazing. A fab card for this week’s challenge. I love reading your blog, papercrafting and everything else in between – although you are killing me with those lovely recipes – I need to join a gym!!!! GORGEOUS background, this is such a pretty card! !